The Census Bureau reports a 1.6% growth in U.S. retail trade. US Dollar Index jumps to 2-week highs above 97.40. With the initial market reaction to upbeat macroeconomic data releases from both Canada and the United States, the USD/CAD pair touched a fresh 2-day high at 1.34 before retreating slightly. As of writing, the pair was up 0.34% on the day at 1.3384. Statistics Canada today reported that retail sales in February increased by 0.8% on a monthly basis following January's 0.4% decline. Other data from Canada today showed that, according to the ADP, employment in March increased by 13.2K. However, with the greenback taking advantage of the upbeat data from the U.S., the pair didn't have a difficult time staying in the positive territory. Retail sales in the U.S. rose by an impressive 1.6% in March to beat analysts' estimate for a growth of 0.7%. Additionally, initial jobless claims decreased by 5K to 192, its lowest level since 1969. Boosted by the data, the US Dollar Index, which earlier in the day advanced to 97.30 area amid risk-off flows, jumped to its highest level in two weeks at 97.42. Later in the session, the Markit's Manufacturing and Services PMI data will be the next driver of the greenback's valuation ahead of the Easter break. With a decisive break above 1.3400 (daily high/Apr. 16 high), the pair could target 1.3450 (Mar. 28 high) and 1.3500 (psychological level). On the downside, support could be seen at 1.3330 (50-DMA), 1.3275 (Apr. 17 low) and 1.3230 (200-DMA). James Knightley, chief international economist at ING, notes that the US retail sales surged 1.6% higher in March, its best reading since September 2017, and better than market expectations of a 1.1% gain. • A goodish pickup in the USD demand exerts some fresh pressure at higher levels. • Stronger US monthly retail sales provided an additional boost to the greenback. • Weakness below weekly lows might prompt some aggressive technical selling. The AUD/USD pair extended its intraday rejection slide from the 0.7200 handle and refreshed session lows in reaction to mostly upbeat US macro data. The pair continued with its struggle to sustained/build on its momentum beyond the 0.7200 handle and once again witnessed some long-unwinding trade from the very important 200-day SMA amid a goodish pickup in the US Dollar demand. Sluggish Euro-zone PMI prints reignited global growth concerns and partly offset the latest optimism over a possible US-China trade deal, which eventually turned out to be one of the key factors benefitting the greenback's relative safe-haven status. The already stronger USD got an additional boost in wake of upbeat US monthly retail sales data for March and steady initial weekly jobless claims, with bulls shrugging off a slight disappointment from the Philly Fed Manufacturing index for April. The latest leg of a downtick since the early European session has now dragged the pair back closer to weekly lows, which if broken might prompt some fresh technical selling and pave the way for further intraday weakness ahead of a long Easter weekend. Ramya Muthukumaran, economist at the Royal Bank of Canada, notes that the Canada’s February retail numbers came out slightly stronger than expected but part of the increase reflected higher gas prices that pushed up sales at the pump by 1.9%. According to analysts at TD Securities, for the US economy, residual seasonality continues to be a lingering factor in first and second quarter GDP data. As discussed yesterday, USD/CAD reached the 1.3400 bull target. USD/CAD is finding resistance at the 1.3400 figure. In the short-term USD/CAD is capped by 1.3400 figure. The 1.3360 and 1.3330 level should come into play for bears in the coming sessions. "The index for current manufacturing activity in the region decreased from a reading of 13.7 in March to 8.5 this month," the Federal Reserve Bank of Philadelphia said in its latest Manufacturing Business Outlook Survey. The new orders index increased 14 points to 15.7 this month. The current inventory index fell, by 15 points to a reading of 2.6. The current employment index increased from a reading of 9.6 in March to 14.7 this month. The diffusion index for future general activity declined nearly 3 points to 19.1, its lowest reading since February 2016. "Employment in Canada increased by 13,200 jobs from February to March according to the March ADP Canada National Employment Report," the ADP said in its press release. • The shared currency continues to be weighed down by today’s sluggish Euro-zone PMIs. • The USD gets an additional boost after stronger than expected US monthly retail sales. The EUR/USD pair maintained its heavily offered tone through the early North-American session and dropped to fresh one-week lows, further below mid-1.1200s post-US macro data. Having repeatedly failed to find acceptance above the 1.1300 round figure mark, the pair met with some aggressive selling pressure on Thursday after yet another disappointing release of Euro-zone PMI prints for April. Sluggish European data weighed heavily on the shared currency and also reignited global growth fears, which further underpinned the US Dollar's relative safe-haven status. The greenback got an additional boost in reaction to the latest macro data, showing that the US monthly retail sales recorded a stronger than expected 1.6% m/m growth in March. Adding to this, core retail sales - excluding automobiles, and the closely watched Retail Sales Control Group also bettered market expectations and remained supportive of the bid tone surrounding the buck. Meanwhile, the better than expected release of the usual initial weekly jobless claims, coming in at 192K for the week ended April 12 as compared to a rise to 205K expected, was partly offset by a slight disappointment from the Philly Fed manufacturing index, which fell to 8.5 for April from 13.7 previous and 10.4 anticipated, and thus, failed to provide any additional bullish impetus. Nevertheless, the pair remains on track to end the week on a downbeat note and erode a major part of the last week's goodish recovery gains, clearly indicating the resumption of the prior/well-established bearish trend. "In the week ending April 13, the advance figure for seasonally adjusted initial claims was 192,000, a decrease of 5,000 from the previous week's revised level," the U.S. Department of Labor announced on Thursday. This is the lowest level for initial claims since September 6, 1969 when it was 182,000. The 4-week moving average was 201,250, a decrease of 6,000 from the previous week's revised average. The advance number for seasonally adjusted insured unemployment during the week ending April 6 was 1,653,000, a decrease of 63,000 from the previous week's revised level. GBP/USD is trading below the round number of 1.3000 in reaction to the upbeat US retail sales. Headline sales rose by 1.6% in March, core sales by 1.2%, and the control group by 1%. The increase in the control group, known as the "core of the core" is somewhat more moderate when considering the downward revision in the data for February. The US Dollar reacted positively, and GBP/USD dropped off 1.3000, hitting a low of 1.2992. The fall also sent cable below the long-running uptrend support line that accompanies the pair since early March. Further support is seen at 1.2985 (April low), 1.2960 (March low), 1.2895, and 1.2830. Resistance is at 1.3030 (recent support line, and 1.3070 (recent swing high). Earlier, UK retail sales also beat expectations, helping GBP/USD escape the 1.3000 level. However, the market mood weighs on the pair. The safe-haven US Dollar rose after German Manufacturing PMI missed expectations, causing concerns about global growth. According to analysts at Westpac, the Australian consumer mood is delicately balanced heading into mid-2019. "Following three consecutive monthly declines, retail sales rose 0.8% in February to $50.6 billion," Statistics Canada reported on Thursday. Sales were up in 5 of 11 subsectors, representing 73% of retail trade. Higher sales at general merchandise stores and motor vehicle and parts dealers were the main contributors to the increase. After removing the effects of price changes, retail sales in volume terms were up 0.2%. The (advanced) data published by the U.S. Census Bureau showed that retail sales in March increased by 1.6% in the U.S. to beat the market expectation of 0.9%. Advance estimates of U.S. retail and food services sales for March 2019, adjusted for seasonal variation and holiday and trading-day differences, but not for price changes, were $514.1 billion, an increase of 1.6 percent from the previous month, and 3.6 percent above March 2018. Total sales for the January 2019 through March 2019 period were up 2.9 percent. Retail trade sales were up 1.7 percent from February 2019, and 3.5 percent above last year. According to analysts at TD Securities, the April Flash PMIs of Eurozone were mixed, with the euro area Manufacturing PMI picking up slightly to 47.8 while the Services PMI slipped to 52.5. USD/JPY is correcting down as the bears will need to break 111.80 to reach 111.60 and 111.40 to the downside. Strong resistances are seen at 112.00 and 112.20 level. The US Retail Sales at 12:30 GMT can bring volatility to USD-related pairs. US Dollar Index clings to daily gains above 97. Risk-averse environment helps the DXY gain traction. Coming up: Retail sales, Markit Manufacturing & Services PMI data from the U.S. 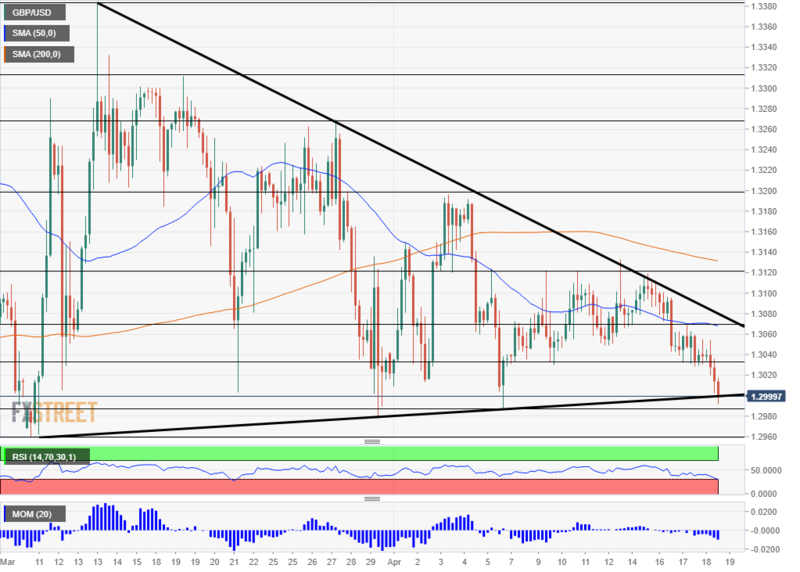 The USD/CHF pair closed the day in the positive territory for the 9th time in the last ten days on Wednesday and preserved its bullish momentum today to advance to its highest level since early March at 1.0118. As of writing, the pair was trading a couple of pips below that level, adding 0.15% on a daily basis. If the pair surpasses the 1.0128 mark, where the November 2018 peak is located, it will reach its highest level in more than 2 years. The broad-based USD strength today's seems to be fueling the pair's upsurge. Ahead of the IHS Markit's preliminary Services and Manufacturing PMI data and March retail sales figures, the US Dollar Index is adding 0.3% on the day at 97.31. Previewing the retail sales report, "We expect the 0.7% m/m improvement in sales in the key control group to be supported by a normalization in tax refunds, rising real disposable income and a still humming labor market,” TD Securities analysts said. The heavy selling pressure witnessed on the shared currency following the disappointing Manufacturing PMI releases fro Germany and the eurozone seems to be boosting the demand for the greenback, which is seen as a safer alternative. • The precious metal stalled its recent decline and managed to stage a modest recovery from support marked by 50% Fibo. level of the $1196.40-$1346.85 strong up-move. • Slightly oversold conditions on the 4-hourly chart prompted some short-covering amid resurfacing global growth concerns following today's sluggish Euro-zone PMI prints. • However, given that the commodity has already confirmed a near-term bearish break through a descending triangle, the current bounce might still be seen as a selling opportunity. • Hence, the recovery seems more likely to confront some fresh supply and fizzle out near the triangle support break-point, now turned resistance - around the $1281-82 region. • Any subsequent up-move seems more likely to remain capped near the $1289 confluence barrier - comprising of 100-day SMA and 38.2% Fibonacci retracement level. Saudi Arabia's Crude oil drops to 6.977 million BPD in February. Weak PMI data from Europe weigh on the sentiment. Earlier today, the data published by the IHS Markit showed that the business activity in the manufacturing sector continued to contract in Germany and the eurozone, causing concerns over an economic performance weaker than initially expected in the euro area. The risk-off atmosphere weighed on the demand for commodities and pushed the WTI lower to $63.50 area. However, with the Joint Organisations Data Initiative (JODI) reporting that Saudi Arabia's crude oil exports in February dropped to 6.977 million provided a modest boost and helped the WTI retrace its daily fall. There won't be any data releases that could impact crude oil's trading action in the remainder of the week and the WTI is likely to continue to fluctuate in its two-week-old $63.50 - $64.50 range.